Do you sometimes get frustrated reviewing your child for his exams because he seems not to get it quickly? Do you sometimes struggle in making your child read a book or construct sentences? Do you sometimes fear that your child is becoming lazy for school work? Do you sometimes worry that your child is not interested in studying at all? Don't feel guilty if you've answered mostly yes because honestly, I sometimes feel frustrated or worry about a not so over-the-top performance of my child in school and lack of interest in some areas in academics. But I had a fresh perspective on intellectual development when I was invited to attend an intimate social media press event for BrainFit Studio Philippines. Last week, I was one of the fortunate moms who had an opportunity to listen to an educator and expert, Ms. Marlene Teo's presentation about how our mystery brain really works and how to keep it fit. These five (5) pillars of cognitive development impact how we acquire new knowledge, retain information, apply learning and perform excellence. It's just normal for us parents to expect our child to excel in school especially if we're the all-supportive, super hands-on and mega-studious type of parents. But did you know that as simple as copying notes from the blackboard, our child is already multi-tasking and a lot of brain areas are working together to compete that simple task? What more if they listen to the teacher, recite, answer quizzes, do seat works and create an art project? And we expect a lot more right? What parts of the brain work when a child is writing. As one of the select attendees, we were encouraged to bring our children to let them experience first hand the activities offered in their studio. These activities involve exercises which are all task-driven, time-bound but at the same time, super FUN! My son were given tasks that challenged his physical endurance, ability to follow instructions and management of time. Mashing and fitting the clay in his hand on the large pink circle as many times he could in 1 minute. BrainFit instructor showing how it should be done. Go go go kids! You can still hold it! The first step is via a process called “Cognitive Mapping” of one’s strengths and weakness across all the 5 brain pillars using US-qualified testing methodologies. Based on the findings, the appropriate program are then recommended to improve on opportunity areas. First, I had a fresh perspective on our children's intellectual developments. I realized that sometimes I may be expecting too much from my gradeschooler without understanding fully that what he's learning in school may not match his level of brain profile. It could be either too hard, he then gets discouraged. Or it could be too easy that he loses interest. 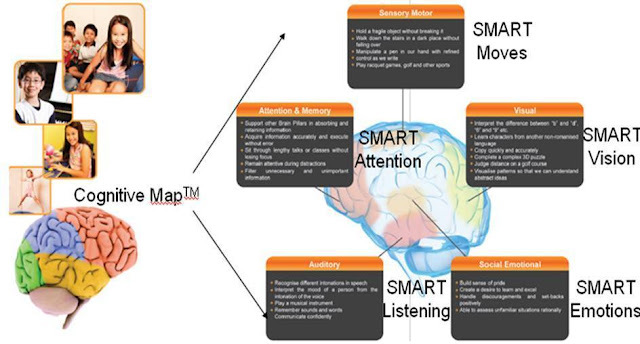 I'm happy to know that there are cognitive development studios that aid in scientific brain training based on the child's individual brain profile. I feel that educators should also be aware of the difference of their students' level of intellect and find a way to adjust to these levels to ensure maximum level of holistic learning in school. 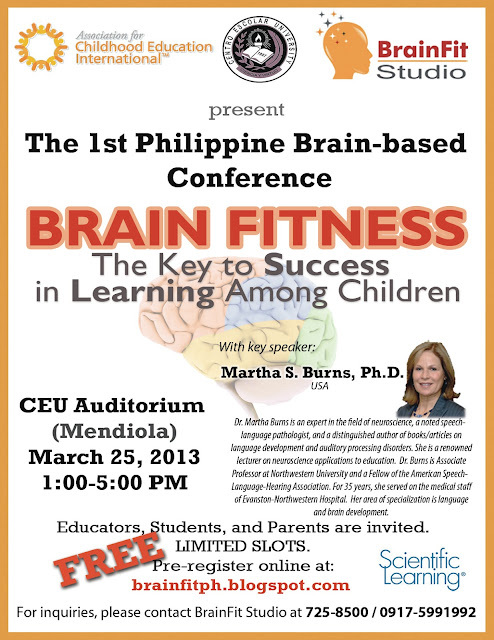 Good thing, BrainFit Studio is presenting its first ever FREE Brain Fitness Conference on March 25, 1:00 pm to 5:00 pm at Centro Escolar University Auditorium. I will be attending this as well as 699 more people to enrich myself with knowledge on how I could help my children apply the Keys of Success in Learning. After being fed with this vital information on brain fitness for my children's cognitive development, I became more conscious on my reviewing/teaching styles to my kids. But at the end of the day, it's still of great importance that they grow in a home filled with love from family, full support in their interests and a healthy spiritual upbringing. As a parent, I invite you to this conference. Slots are limited so if interested, you may pre-register online at: http://brainfitph.blogspot.com. BrainFit Studio is located at 3/F Metrosquare Building, 224 Ortigas Avenue, Greenhills, San Juan 1502. This is a very helpful program for us parents. I will need this in the near future. This is a wonderful programs to help develop the skills of the children. I will definitely share this to my SILs and hopefully find the program suitable for their kids especially this summer vacation. Hope to see you again soon @facebook-539799756:disqus !